Phalaenopsis orchids are Americas favorite orchid. Their low-maintenance and long bloom life make them especially popular with all growers. From the time the first flower bud opens, the floral �spray� on a Phalaenopsis will remain in bloom for 2 to 3 months. Phalaenopsis orchids will bloom season after season, provided they are properly cared for and periodically re-potted in the right potting mix. It is specifically blended to retain the proper mixture of fertilizer and moisture needed to stimulate superior Phalaenopsis plant and root growth. 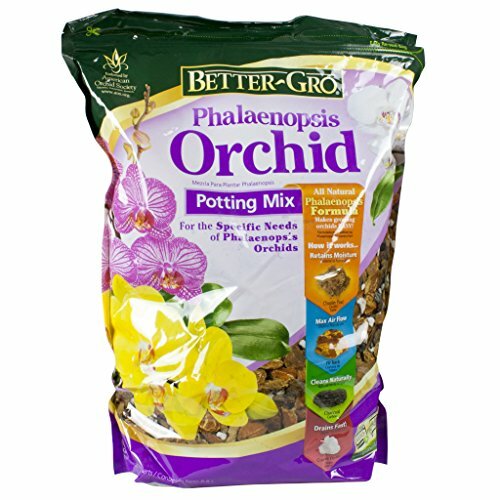 Better-Gro Phalaenopsis Mix is a wonderfully rich mixture of Canadian chunk peat blended with western fir bark, hardwood charcoal and coarse perlite. This professionally formulated potting media nurtures spectacular, colorful and long-lasting Phalaenopsis orchids. This product weight 8 quarts. View More In Fertilizers & Plant Food. If you have any questions about this product by Sun Bulb, contact us by completing and submitting the form below. If you are looking for a specif part number, please include it with your message.